When I moved into my new apartment two years ago, I was determined to fill it with sustainable furniture and decorations. I had sublet my three previous NYC apartments so that I could travel, and they all came pre-furnished. I didn't own anything other than a couple of suitcases, lots of books, and lots of clothes. I needed a bed, bookshelves, and a desk for my room. I also needed bedding, a mattress, curtains, and lighting. I share my apartment with a roommate, so my priority was my bedroom. In my next apartment, however, I look forward to furnishing every room sustainably. Check out my tips below for furnishing your small space sustainably, and see my bedroom too! Measuring may not seem like a tip for sustainability, but it's actually quite important. If you buy things without knowing how they will fit in the space, you are more likely to be disappointed by how your room looks and feels, and therefore create more waste if you have to replace them. Measure each wall's length, to determine where furniture can be placed. Also measure the height of your ceilings, doorways, and any windows your room may have. Make a simple drawing of your room's floor plan, and write down each measurement as you go. You can use this to reference when you're searching for each piece of furniture. What piece do you want where? How much room will they have on each wall? How much free space to walk will be left around each piece after you bring them in? List your must-have pieces first. What do you have to have right away and what can wait? My must-haves were my bed frame and mattress, bedding, hangers, and curtains. My next priorities were a bookshelf, desk, and a mirror. The least pressing items were decorations such as paintings, plants, rugs, and lamps. Knowing exactly what you need allows you to avoid impulse buys that often end up in a landfill later. Leave room next to each item on your list. You will want to right down the measurements of each possible furniture purchase you find and reference that with the floor plan you measured earlier before you buy them. Does the bed you love have enough room? How much room does that leave for the dresser you found to go with it? My room has a mix of newly made pieces along with used ones, as I couldn't find everything new that I needed sustainably made, at a price point I wanted to spend. What does your budget allow? Invest in sustainably made, new pieces that you want to keep for decades if you have the money and desire to do so. You can also find amazing refurbished and used furniture in vintage stores or on websites like Craigslist and Ebay. I decided to invest in my bed and bedding, and be more creative with the rest of my budget by searching for a secondhand desk and shelving. I found amazing steel table-legs for the base of a desk, similar to the one shown here, at a flea market in Williamsburg. Later I was able to find a wooden desktop at Big Reuse Brooklyn that fits perfectly on top. Mixing old and new things is fun and a wonderful opportunity to be creative. If you want to make the most of your small space, invest in furniture that has more than one function. Choose pieces with unexpected storage compartments and space-saving extensions. 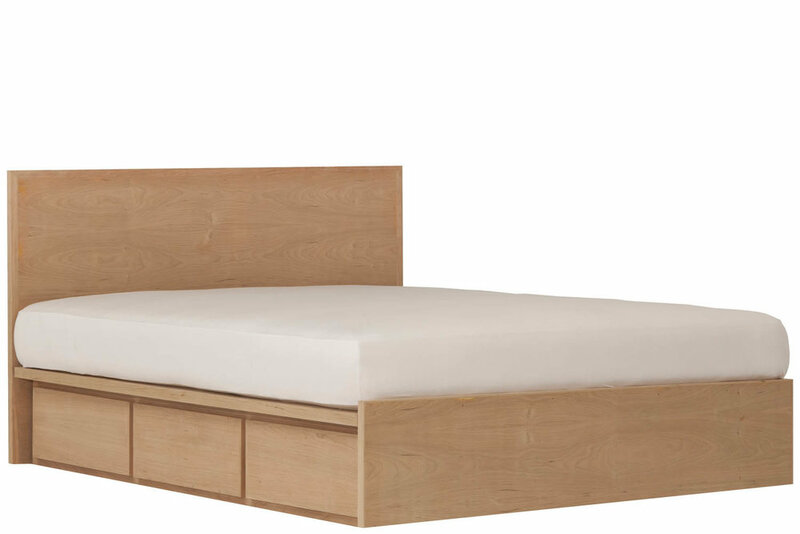 I got my sustainable bed frame from Urban Green Furniture. They are based in Brooklyn and build beautiful, modern furniture that is sustainable and built to last. I was able to save valuable space, that would have been taken up by a dresser, with its built-in drawers underneath. Pieces need to last a long time in order be categorized as sustainable, and not just made from organic materials. Because of this, I made my furniture choices based on their versatility and ability to transition with me into new spaces. I purchased Elfa shelving brackets, so that I could move them and change the layout of my shelves depending upon the spaces I may occupy in the future. I also loved the Elfa system because you can choose your own shelves for them. Mine are made from reclaimed wood also from Big Reuse Brooklyn! Versatility is essential to sustainability, and in a small space transformable systems are key. Shop for plants at your local farmers market, and ask for plants that require less water if possible. I have chosen a variety of succulents for my room, including 3 cacti species and a Yucca tree, because they require very little water and a hardy. The less resources required to keep a plant alive, the better! I purchased my organic cotton duvet from West Elm, my sheets from Ettitude, my natural hemp curtains from Rawganique, and my mattress from Keetsa. There are so many fantastic sustainable bedding options, so I encourage you to shop around and go with whatever your budget and location will allow for.